Celebrate the kick off of ChristmasTown USA with a festive 5K under the lights. Join 1300 of your closest friends in the jolliest town in the area for a fun 5K race. The light show doesn’t officially begin until Monday, December 2nd but participants in the ChristmasTown 5K get a sneak peek of all that’s involved in the nationally recognized holiday display. The race, held on Saturday, November 30th, is a great way to get an up close look at Christmas Town USA without the traffic. Who should go: Anyone who loves Christmas, small towns and incredibly large numbers of tiny little lights. Is there anything other than running?! Yes! Come cheer on your friends and family, enjoy the post race party, and grab a snack! Race is limited to the first 1300 participants. Register online with the blue link below or at any Gaston County Family YMCA front desk. How do I register online for the ChristmasTown 5K? To complete registration you will need to log in to your account or create one if you are not currently in our registration system. The box on the left is used to log in with your email and password if you already have an account online. The middle box is for those who have participated at our Y in the past but have not registered online and need a password. The box on the right is for those new to our registration system. For those new to our registration system – Online registration requires you to sign up in our database. Please choose any default branch and then “participant” as your membership type if you do not wish to join our Y. 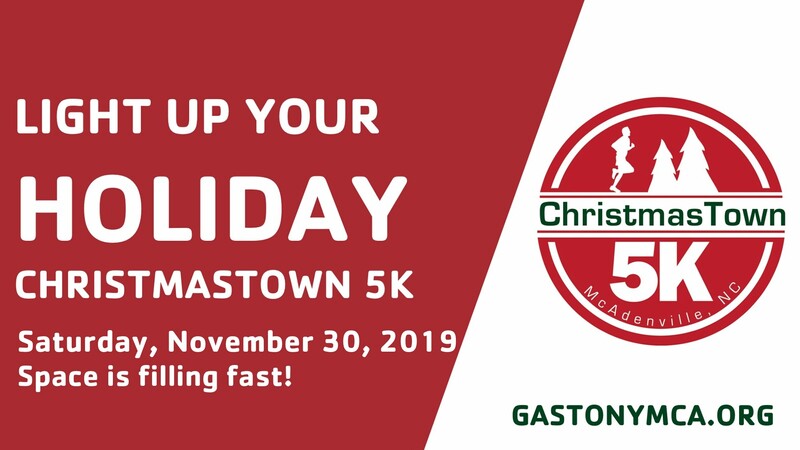 Will the ChristmasTown 5K fill? Yes! Registration will close November 23 or when it hits the race limit of 1300 runners. The race filled on Tuesday, October 16 in 2018. Will there be an early packet pickup? Yes, and this is encouraged! Packet pick up will take place at the Pharr Family YMCA in the upstairs ballroom! It is fine for someone other than yourself to pick up your packet. We do ask that they have either your full legal name or your address on hand so we can easily find you on the list. What’s included in my packet? Every participant will receive a bib, safety pins, official 5K shirt, course map and information sheet, as well as a fun surprise. Local McAdenville businesses are also including coupons especially for you. There are several parking areas for the race. McAdenville streets will close at 5 PM and remain closed until 7:30 PM. If you park at the home of a McAdenville resident, please use their driveway and do not park on the course. A YMCA shuttle will transport runners to and from this lot in Lowell beginning around 4:30 PM. If you think you will need to leave the race before 7:30 PM you should plan to park at Harold Rankin Park in Lowell. This shuttle will be able to run throughout the race since this lot is located outside of the race course. Cars parked within the race course will not be able to leave until the last runner crosses the finish line and the roads re-open. This will not be before 7:30 PM. This is for the safety of all of our participants and volunteers. Yes, it is a certified course! Click here for a course map. Yes, but we ask that you stay on the race course. Also, please be mindful of competing runners and start at the back of the race. Look for your pace sign. There is a one hour time limit. We are sorry but we do not have the space to hold everyone’s personal items during the race. Anything you bring should be carried on you or left in your car or with a non-runner. The YMCA does not have locker space. There will be bathroom facilities on the left side of the YMCA building before the race. Once the post-race party has begun in the YMCA gymnasium, you may use the facilities inside as well. The building will be locked before the event for security reasons. Please do! The post-race party will include a costume contest with prizes for each winner. Categories are Best Group, Best Child, Best Male and Best Female. You may only enter one category. The timing mat will be located just up from the YMCA on Main Street. Pre-race festivities will be on the plaza in front of the YMCA. Runners will be instructed to make their way from here to the starting mat prior to 6:00 PM.There will be volunteers holding pace signs on the hill beside the start line. Please try and stand near the sign that matches your anticipated finish time.We are excited that the Speed for Need team will be racing with us again this year. This group of brave runners and their athlete-riders will begin the race slightly before our 6:00 PM race start and stay to one side of the road. Please help cheer them on throughout the race! Will the ChristmasTown Lights be on? Yes! The lights will be on for the runners and walkers to enjoy. However, they will be turned off after the race has been completed. After the race fills is there still a possibility to run? Unfortunately no. We cannot accept any additional runners once we have reached the capacity. This number was based on the recommendation by the experts from US Track & Field, Cramerton Police, and race committee approval. Will I need money once I am there? There will be food and ChristmasTown items for sale before and after the race. McAdenville businesses in town will also be open, including Spruced Goose and Table and Market. You might want to bring some cash or a card for these items. Will there be music/entertainment on the course? Yes, We have on-course music and entertainment. Can I wear headphones, run with my pet or push a baby stroller? Headphones and strollers are allowed, but please be aware and cautious of your surroundings. The course has plenty of hills! Be ready! Pets are prohibited. We ask that anyone with a stroller start near the back of the race for safety reasons. How many water stops are there? The water stop is located at the roundabout at the top of Wesleyan. You will pass this area four times on the course, so you will have four opportunities for water. What awards can I expect for my performance? Medals for 1st, 2nd, and 3rd per gender and in increments of five year age groups will be awarded. There will also be awards for 1st place Male and Female. The post-race party will be held in the Pharr Family YMCA gymnasium near the finish line. What does my race fee support? Your fees support the Pharr Family YMCA and the McAdenville Woman’s Club. All money raised stays in McAdenville. For a list of some of the projects that the 5K has supported, you can go to mcadenvillewomansclub.org. Since we have many upfront costs, we have a strict and uniform policy of no refunds or exchanges, no person-to-person transfer, or no deferrals to a future year. We do understand that plans change, injuries happen, and various holiday festivities and situations arise, but, we feel it is most fair to apply a uniform policy to all, instead of a subjective line of who should receive a refund and who doesn’t. All purchases and sales are 100% final, no exceptions. Refunds will not be issued based on weather conditions. We appreciate your understanding in this matter.